#TextureTuesday. Did you know it's a thing? I've found myself scrolling through this hashtag on Instagram for hours, fascinated by all of the amazing colors and textures to behold. And I finally figured, why not do a #TextureTuesday of my very own? 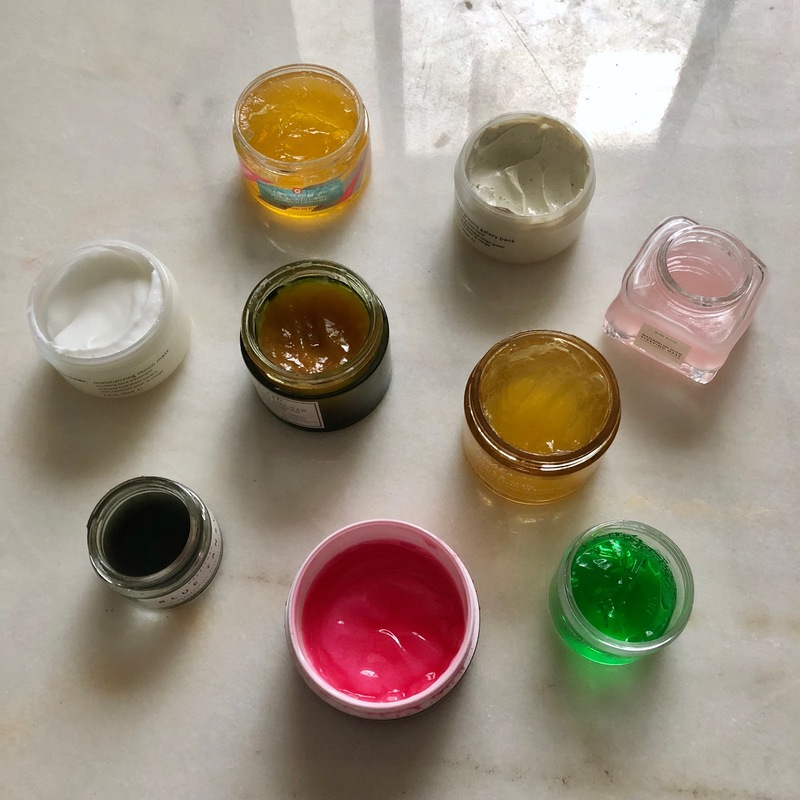 So, introducing my very first #TextureTuesday post, featuring my 9 favorite wash off face masks! Keep reading to find out why each of them made the cut. Well, first of all, First Aid Beauty can do no wrong in my book. I've loved every.single.one. of their products from the very beginning! So it's really no wonder that I love this mask just as much, if not more, than the serums, moisturizers and eye creams that have been in my stash for years. This mask smells tangy, applies like a dream and brightens skin instantly. This is my go-to mask after a crazy night out. You know those annoying pimples that just appear, no matter how well you've been taking care of your skin? Well, this mask will help you get rid of them in a flash. I love the uber-thick texture and the way it subtly hardens on the skin, but I also love that it doesn't strip the skin of essential moisture and it's completely non-irritating. This is my favorite mask when my skin just needs a little extra TLC. I actually already did a full review of this mask (click here for it), but here's the nitty gritty of what you've gotta know. It smells sweet and delicious. It sinks into skin within 2 minutes. And you wake up with such a glowy visage, you'll think you've died and gone to watermelon heaven. Yes, a second Glossier mask -- because they're both just that good! I actually use this mask as a night moisturizer -- I just apply a thinner layer all over my face and sleep with it on, and then I wake up with unbelievably soft skin. I can't get enough of the pillowy, marshmallow-like texture. I've bought this mask 4 times! This was a splurge for me and one I was really hoping would pay off. Luckily, it did. The texture of this mask is so interesting -- it's formulated with 50 percent real crushed citrus fruits (including oranges, lemons and clementines), which naturally contain the AHA fruit acids that refine and smooth skin. What this means? A mere 20 minutes with this sweet-smelling mask on your face and you'll be left with soft, glowy skin that looks like you just got the best facial of your life. The name of this mask tells you everything you need to know. Calendula and aloe both work to soothe dull, tired, lackluster skin that's just in need of a little extra TLC. But here's the best part -- this mask works in only 5 minutes! Yes, 5! I like to put it on in the morning before I get in the shower and let it work its magic, then hop in and rinse it off ... and voila! My skin is back to square one! You know those brands with a cult following that you just assume can't be as good as the hype? That's kind of how I felt about Herbivore Botanicals. Luckily, I was very, very, VERY wrong. A blend of white willow bark (a natural BHA), fruit enzymes (natural AHAs) and blue tansy oil (naturally high in Azulene) work to clarify, smooth and refine the skin while reducing redness. Just apply a thin layer, leave it on for 15 minutes until it hardens, and then rinse off. I've definitely seen a difference every time I use this mask, and I love that it's safe for even the most sensitive skin. A miracle worker? Absolutely! Okay, I may have bought this mask solely because of the color. Come on, it's fuchsia and packed with shimmer! It's really just a bonus that it smells amazing and plumps up the skin in only 10 minutes. I love using this mask in conjunction with a collagen sheet mask for extra hydration and firmness. This mask is a cult favorite for one very specific reason -- IT WORKS. And I may be biased since cucumbers are my favorite vegetable, but don't let that stop you from trying this true skin savior. It refreshes, it detoxifies, it soothes, it hydrates ... oh, and did I mention all of this happens in only 10 minutes? Pro tip: keep it in your refrigerator so it feels extra cool when you apply. What a pretty and colorful assortment of masks! I love masking, and I need to try a few of these! How cool 😎 The watermelon and moon masks are calling my name! I didn't know anyone else was as crazy about these kinds of masks as I am. You've got to try some from FarmHouse Fresh. Their textures and fragrances are wonderful. I also like a lot of the Body Shop Masks especially the radiance one and the hydrating one. Awesome roundup! I love the new one from Origins with honey. It's decongesting because of the charcoal and moisturizing at the same thanks to honey. Ok seriously I want to try ALL of these! I need some new wash off masks, my sheet masks are starting overrun my collection. I see a few on your list that I can start with!